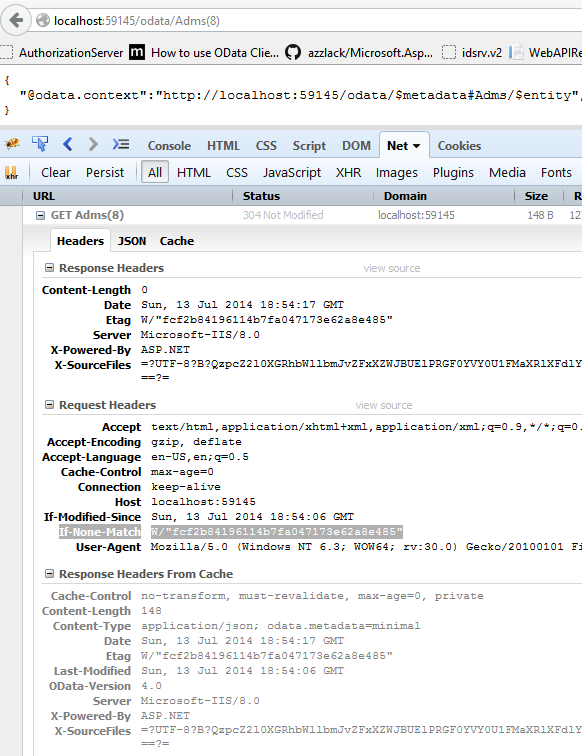 This article shows how easy it is to implement cache with Web API OData. 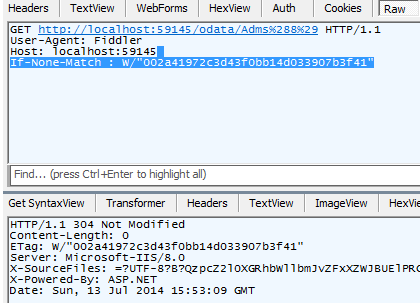 Web API OData V4 now supports Etag and also If-None-Match HTTP headers. These can then be accessed and set using the ODataQueryOptions inside an OData controller. This works well and could be a possible solution if you want to implement everything yourself. Another possible solution is CacheCow from Ali Kheyrollahi. This post is part 9 of the Web API OData V4 series. This is very simple. Just add the CacheCow Server NuGet package to your server project. Now all controllers including the OData controllers will use in memory cache from CacheCow. If you send this in your next request in the header, you will recieve a Http 304 which tells the client you already have the resource. This all happens automatically in your browser. You can check this in Firefox with Firebug. CacheCow also provides persistent cache solutions with different providers and also client caching solutions. Before you start implementing everything yourself with Etag and If-None-Match HTTP Headers, I would recommend looking at CacheCow first. I’ve been using your Web API post series to implement my Web API OData 4 server. Your posts have proven invaluable! For thank I thank you many times! In part 2 of your series you mention that the way to access the different queries we have to use Attribute Routing (and actually only after correctly applying it I was able to start using my queries). Having said that, I ask you…what is your take on the note by CacheCow’s people? And what should happen if I have attribute routing and I install CacheCow?